There are many ways to rehydrate butterflies. The method below is the one I use and find works well for me every time. It is best to practice first on some cheap or damaged butterflies before you try it on something you've paid a lot of money for. Fill a dish with boiling water. 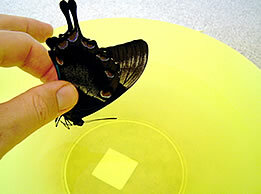 Dip the antennae into the hot water for a few seconds. Be careful not to wet the wings. 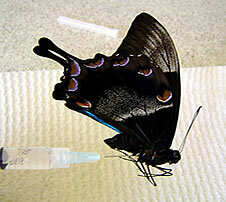 Using a small syringe, inject the thorax with hot water. I usually keep injecting until water has dribbled out for a few seconds. 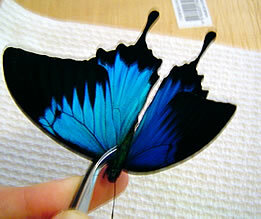 Be careful not to inject water into the space between the wings. 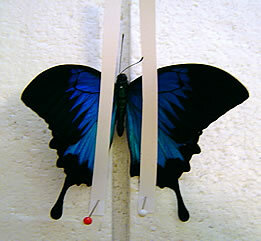 Place the specimen on a paper towel while you do any other specimens you have. Have a shallow plastic container already prepared for the specimens. 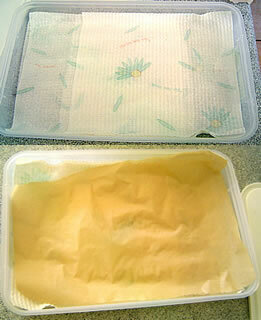 Put a few layers of paper towels inside the container and spray each layer with water until damp (not soaking wet). Place a dry piece of unwaxed paper on top of the damp paper towels. Place your specimens on top of the dry unwaxed paper. Put the lid on the container and let your specimens sit for about an hour. I put the container on top of the container of hot water. Place the specimen on a paper towel and gently press on the thorax with the blunt end of a pair of tweezers until you feel (and hear) it crush. Be careful not to squash the thorax completely. Repeat on the other side. If the specimen is quite old you need to be especially careful. 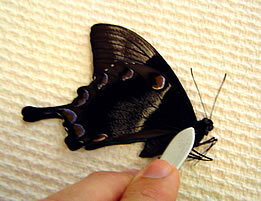 Holding the specimen as shown, squeeze the tweezers so that the wings open slightly. 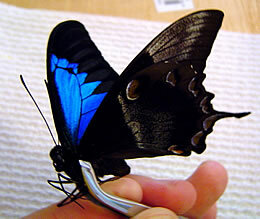 Hold the wing where it joins the thorax and manipulate the wings open and closed. 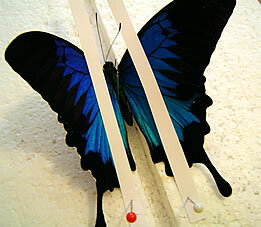 The idea is to make everything supple so that the wings open easily. Repeat on the other side. Push a pin through the thorax and pin it to the pinning board so that where the wings join the thorax is level with the top of the pinning board. I make my own boards from pieces of stiff foam glued together. Pin thin strips of card on either side of the body as shown in the picture. Place a pin next to the abdomen on the side you are going to pin out first. This keeps the body more or less in place while you open the wing out. 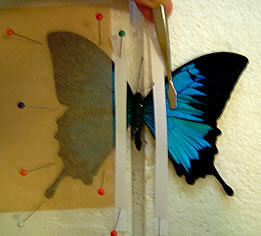 Move the wings into the position you want using the pair of tweezers. I use stamp collecting tweezers because they are nice a smooth and won't damage the wings. Be careful not to rip the wings. Hold the wing in position by pressing down gently on the cardboard strip. 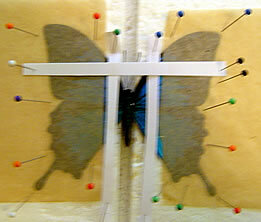 Place a piece of unwaxed paper over the wing and pin around the outside. Repeat on the other side. Remove the pin from next to the abdomen. This is what the finished specimen should look like. If the abdomen droops or is off centre, use pins to put it in the correct position. 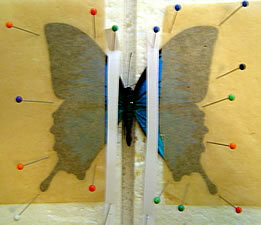 Use a strip of card and pins to position the antennae. 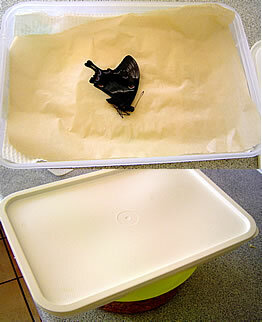 Leave the specimen in a cool, dry place for about a week to dry out fully. Keep ants etc away by using some surface spray in the area where your specimen will dry. Once it is dry, remove the pins and store your specimen in a safe place. Use plenty of moth balls.